With an open area of 52%, weave type EGLA-MONO 4391 proves effective solar shading to the Post Graduate Centre at the Heriot Watt University. Pictures taken during the construction phase showing the near-complete installation of one of the six facades created using MULTI-BARRETTE 8301. 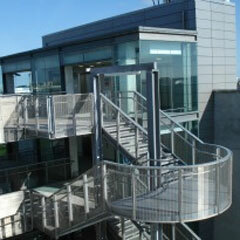 The openess of MULTI-BARRETTE provides natural light and ventilation to the floors of the car park. Architect : Aukett Ltd., London. The twin wires of EGLA-TWIN 4243 made it easy to form the panels to the desired curved shape. 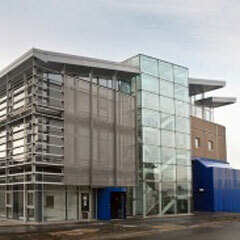 Not only does the mesh act as a facade to the staircases, but it also offers a degree of protection from falling rain. Located amidst the Old Town, the EGLA-TWIN façade adds 21st century design to this beautiful part of Montreal. 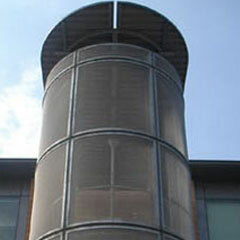 Elements of EGLA-TWIN 4313 cover the different levels of the building providing sun protection. 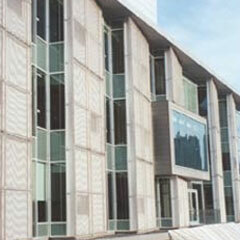 At the same time the openess of the mesh allows natural light to transmit to the building within. The Haver & Boecker tensioning system using flat tension profiles and clevis screws ensures optimum tension. 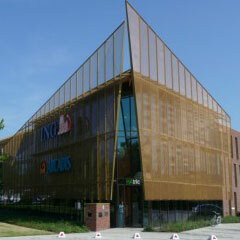 The key component of this façade is the architectural woven wire mesh. DOKAWELL-TRIPLE 3803, designed, engineered and manufactured by our sister company Haver & Boecker, is made of PET coated stainless steel wire. Its weather resistance has been successfully tested, so the material offers longevity which meets the expectations of the architect.